DIY - Candy Gram fundraiser! 1. Schedule your candy gram fund-raiser close to a major holiday, like Halloween, Christmas or Valentine’s Day, so you can take advantage of all the candy on the market at those times of year. It will also give your buyers a good reason to send a candy gram. 2. Choose simple, inexpensive candies, like lollipops or candy canes, which can be purchased in bulk at a low price and resold for profit. 3. Buy card stock and create small cards to attach with ribbon to the candy gram. You can get creative with these little cards; for example, cut them into shapes like hearts for Valentine’s day, snowmen for Christmas or jack-o’-lanterns for Halloween. 4. Advertise for one to two weeks before the big event so people have time to save up for participation. You can hang up fliers or have your school add it to their daily announcements. 5. Set up your table in an accessible area that people will see. Try to keep it out of the way but near a high-traffic area to draw attention and offer customers room to move around while filling out their candy grams. 6. Make your price reasonable. Calculate the cost of supplies into the cost of your candy grams, allowing enough room to earn a profit. For example, if you spent 10 cents per piece on candy and five cents per piece on card stock, charging 50 cents per candy gram would earn you a 35-cent profit per piece. 7. Leave markers or pens on the table so customers can fill out their own cards and add personalized messages. 8. 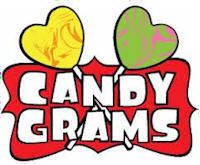 Offer to deliver the candy grams to their destination and keep track of addresses in a notebook or ledger. In order to make things easier on yourself, you can pair up each candy gram with a number on the back of the card, then match that number in the ledger to organize deliveries.